[0.3 participation points.] In general, what is the difference between an average and an instantaneous quantity? (A) The amount of change that takes place. (B) The amount of time for a change to take place. (C) How fast the object is moving. (D) The number of times that a change takes place in a given time interval. For example, average velocity is defined as the displacement of an object divided by a finite time interval, whereas instantaneous velocity is defined as the vanishingly small ("infinitesimal") displacement of an object divided by a vanishingly small ("infinitesimal") time interval. Students seemed to confuse the semantics of the term "average" with the sampling of many results, as opposed to "instantaneous" being only one event. [0.3 points.] Consider a side view of the Moon and the Earth, their respective shadow zones, and the locations of an observer. The Sun is located to the left, far off of the page. The Moon is partially in the umbra and penumbra of the Earth, and this would correspond to a dark red/brown shadow, and a barely noticeable shadow on the surface of the Moon, respectively. Thus an observer on the Earth would see response (D). However, many students chose response (A), the view of the Earth blocking the Sun, which is what would be seen from the surface of the Moon, in its northern hemisphere (the portion of the near side of the Moon that is in the penumbra). A "Student" t-test of the null hypothesis results in p = 0.20, thus there is no significant difference between Cuesta College and UC-Davis FCI pre-test scores. The Physics 5A students at Cuesta College found these preliminary results interesting—while they are slightly more knowledgeable about the Newtonian physics concepts covered in the FCI as UC-Davis students at the start of introductory college physics, this difference is not statistically significant. Later this semester (Spring 2008), a comparison will be made between Cuesta College and UC-Davis FCI post-tests, along with their pre- to post-test gains. Students are given an opportunity to either opt-in or opt-out of having their concept survey results included in education research. To gather information on student understanding of concepts and attitudes towards science, in the form of pre-test and post-test surveys. This information will be analyzed by instructors at Cuesta College, and at other institutions. Completely voluntary, and personal information will be confidential. Credit for taking these surveys in a conscientious and serious manner will be given regardless of your consent, but it would be very helpful if you would be able to fully participate. No immediate benefit, other than the personal satisfaction knowing that the results from these surveys will assist with assessing and improving instructional methods in science at Cuesta College, in comparison with other institutions. You may request your individual results from these surveys at any time by contacting the instructor (Dr. Patrick M. Len, pmL [at] waiferx.com). You may opt out at any later time by contacting the instructor. Initial one of the following choices, then sign your name and date below. _____My surveys can be analyzed for education research purposes, with complete confidentiality. Forms with no choice clearly initialed, or both choices initialed are considered "opt-outs." This form is given to the students at the start of the semester for the pre-tests, and again at the end of the semester for the post-tests. Usually three-quarters of the students opt-in at the start of the semester, and due to both attrition of opted-out students and changing attitudes, nearly all students still enrolled at the end of the semester remain or switch over to the opt-in choice. [0.3 points.] What causes different seasons in San Luis Obispo, CA? (A) The Sun making very low, or very high paths across the sky. (B) There being less than, or more than 12 hours of daylight. (C) The changing distance from the Earth to the Sun. (D) The axis of the Earth tilting away from, or towards the Sun. 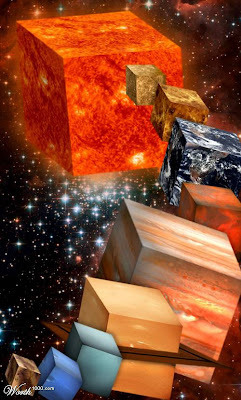 The different paths of the Sun across the sky, and the amount of daylight hours, are both ultimately caused by the axis of the Earth tilting away from, or towards the Sun. After results have been compiled and the correct answer given, students are shown a simulation using Starry Night Pro 3.1 (on a CD-ROM packaged with their textbook, Astronomy: Journey to the Cosmic Frontier, 4/e by John D. Fix). 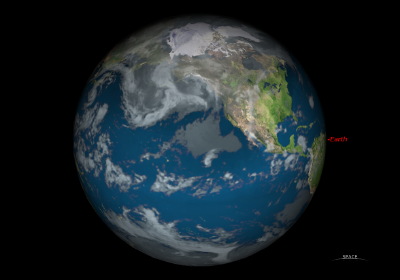 Note that the Earth is noticeably smaller in June 21 than in December 21, as the Earth is at its nearest distance (perihelion) to the Sun on January 4--thus the changing distance from the Sun to the Earth is not the reason for the seasons! 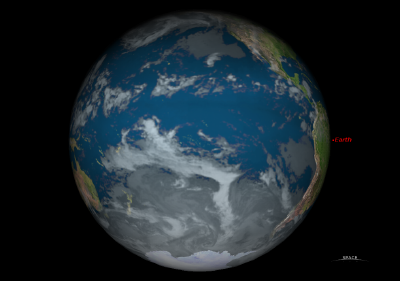 The northern hemisphere of the Earth is tilted towards the Sun during June, and away from the Sun during December, producing both the higher/lower paths of the the Sun across the sky, and the greater/lesser amount of daylight hours. Ergo, the seasons. Students may ask why the hottest month is August, despite the summer solstice being in late June; while the coldest month is February, despite the winter solstice being in late December. This is the same reason why it takes a while for a warm beer to cool off in the refrigerator, and why it takes time for frozen meat taken out of the freezer to defrost--there is a time response lag between thermal loading and temperature. Previously discussed was a recommendation that pre-instruction surveys (such as the FCI, MPEX, SATA, or SPCI) should be administered as students walk into the first day of class, without instruction or discussion of the course the students are in (however, course and section information is already written on the whiteboard). However, some exposition is made to motivate why these students are about to take these surveys, other than to receive a nominal amount of class credit. 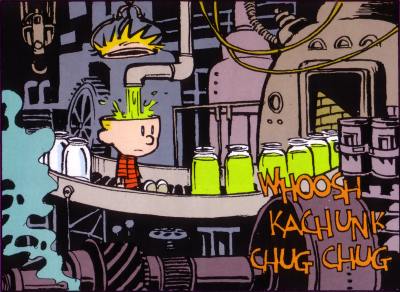 The classic Calvin and Hobbes learning cartoon (above) is shown to the class, but instead of focusing on what is put into the jars and Calvin's brain, students are told that it is important to determine what is already in the jars and Calvin's brain before they are filled—are they all really empty before being filled? The (tongue-in-cheek) reason given to the students for pre- and post-instruction surveys is that the instructor gets paid depending on how much students learn during the semester. Paid, that is, right "here" (instructor points to his heart). Students chortle. Surveys are then handed out. During Fall semester 2007, Cuesta College students taking Physics 5A (college physics, algebra-based, mandatory adjunct laboratory) at Cuesta College, San Luis Obispo, CA used numerical keypad clickers (Classroom Performance System, einstruction.com) to enter homework and to engage in peer-interaction discussion questions during lecture. These are the complete survey results, with some preliminary commentary. No statistical analysis was done (this was the first and only administration of this instrument), but will be forthcoming after more data has been compiled from future semesters. Values for the mean and standard deviations are given next to the modal response category for each question. Note that the order of questions within sections II and III were randomly scrambled for each student. Students rated the usefulness of learning by using clickers in class (II.4), more so than any other instructional mode except for demonstrations/videos in class (II.6). Students rated doing assigned homework that was entered using clickers third highest in terms of learning usefulness, more so than lecturing by the instructor (II.1), reading the textbook (II.5), doing unassigned (but suggested) homework (II.3), and interacting with students outside (II.8) and during (II.7) class. beliefs about the use of clickers in this class. III.3 I would recommend using clickers in future semesters of Physics 5A. Overall, the responses in section III are positive towards the use of clickers. Although students collectively approved of the use of clickers to collect homework, a vocal minority expressed their comments below. of clickers in Physics 5A. compare our answers to.. even if not turned in for points..
even if we all studied hard, it still felt like not enough time. TRIED to do what we could to be quicker and accurate!" "At first, I was mostly deterred by the additional cost incurred. "It was a good idea." recommend them for future Physics 5A class." points. Just remember to stop time and announce 5sec." where unnecessary for such a short class." should use clickers again. They were motivating to come to class." you put in goes un-rewarded." a hassle for collecting homework in my opinion. Have a great day!!" I could not check the answers to myself while doing the homework. credit kind of made the course more difficult." clickers in my other science-based classes (like Chemistry.)" 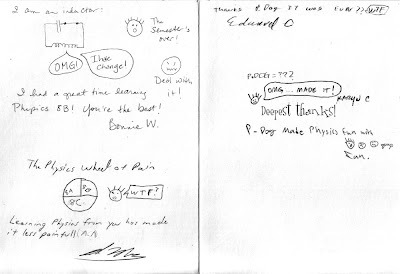 The common threads in these student comments were (1) using clickers during lecture to discuss concepts and problem-solving strategies was received positively; and (2) that assigning even-numbered problems from the textbook (which have no solutions), to be entered using clickers was rated negatively, apparently due to the lack of feedback and guidance, and the arbitrary binary nature of having answers graded correctly or incorrectly. To address this concern, in subsequent semesters assigned homework problems could instead be made conceptual, proportional or ratio analysis extensions to the odd-numbered problems from the textbook (which would have solutions such that students can check to get some feedback before moving on). Clicker question examples used in Physics 5A, Fall semester 2007. Force Concept Inventory (FCI) results for Physics 5A, Fall semester 2007. Maryland Physics Expectations Survey (MPEX) results for Physics 5A, Fall semester 2007. And so it begins, the start of the second half of the academic year at Cuesta College. 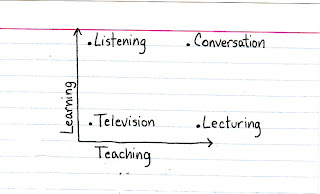 For what it's worth, peer-instruction is all about starting that conversation mode of instruction in the classroom. Hello again everybody! ...How much bonus points do you offer your students and what for? For Astronomy 10 at Cuesta College, officially there are no extra-credit points. However, there is approximately a 10%-15% "overage" in clicker point and lecture-tutorial point categories, which comes out to 5%-8% of the total class points. Students who have missed a few classes can recover these points, and still get nearly the maximum clicker and lecture-tutorial scores. Students who get over and beyond the maximum clicker and lecture-tutorial scores are those who faithfully attended nearly every class and participated (well) in nearly every clicker and lecture-tutorial activity. This "overage" is included in the grade scheme, but only becomes apparent near the end the semester, say, when students realize that the syllabus reports only 25 lecture-tutorials, but then get handed out lecture-tutorial assignment #26, #27, etc., and also when the total maximum clicker points starts to run over 75 points. This turns out to not be popular for students who slack off, and want an easy "out" near the end of the semester to gain points; but the intent is to reward the students who have been sticking it out all semester, but need a modest surprise boost near the end to supplement their efforts. Student attitudes were assessed using an Astronomy Laboratory Learning Survey (ALLS), a 15-question, five-point Likert scale questionnaire with six demographic questions, and 15 exit evaluation questions (Patrick M. Len, in development) to Astronomy 10L students at Cuesta College, San Luis Obispo, CA. This laboratory course is a one-semester, adjunct course to Astronomy 10 lecture, and is taken primarily by students to satisfy their general education science laboratory transfer requirement. The ALLS was administered as a pre-test on the first laboratory meeting, before any introduction/instruction took place; and as a post-test on the last laboratory meeting. 9. Indep. 10. Explain  13. Math     14. Science  15. Diff. There are no statistically significant changes in how students rated themselves as being good at math or science from the beginning of to the end of the semester. With p = 0.10, there is a weak statistically significant change in student preference for collaboration, shifting from working in groups than independently. A statistically significant shift in how students rated the difficulty of the laboratory course (from neutral/moderate to being slightly easier). A statistically significant shift in how students considered themselves better able to understand concepts if they were able to explain them to others. This was considered a key goal for the peer-interaction nature of this course by the developer of the laboratory activities and the ALLS. These preliminary results are encouraging; further analysis may involve investigating the correlation (if any) between this response, and math/science efficacy. Analysis of other questions and in more detail will follow in future studies, as the ALLS undergoes revision from the first version 07.01.03 (administered Spring semester 2007 and Fall semester 2007), to the subsequent version 07.12.29 (to be administered Spring semester 2008 onwards). Sun notwithstanding, but the planets are not to relative scale...and why does Pluto persist being a planet? 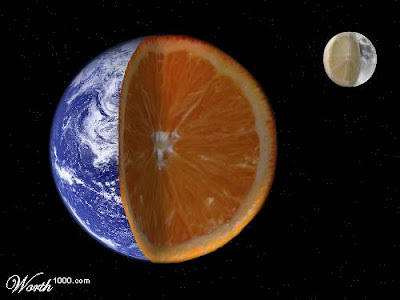 Interesting metaphor for the similar, but somewhat different compositions of Earth and Moon. 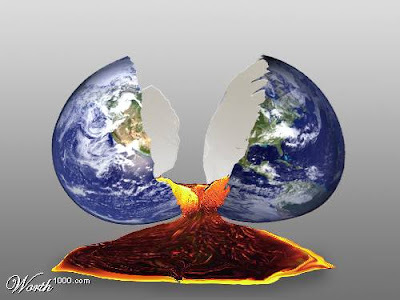 The inner core of the Earth, while hot, is solid due to the immense pressures at the center of the Earth. However, should the pressure on that material be relieved, it would revert to being a hot molten liquid. 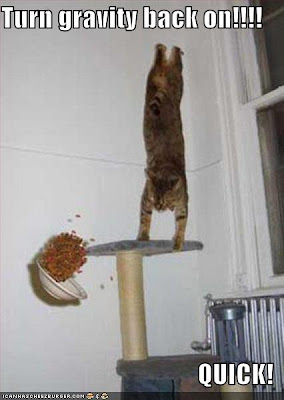 Objects in true freefall, or experiencing repulsive gravitational forces? Kudos: deepest thanks...OMG, made it! Note that students reproduce their favorite mnemonics and artifacts from second-semester introductory university physics (calculus-based). There were no statistically significant differences between the pre-test and post-test results for each section. So why keep administering the SATA to students at Cuesta College in future semesters? First is that due to the small class sizes, it would be encouraging to gather more consistent data while accumulating a sizeable data population. Second is that there appear to be statistically significant post-test differences in cognitive competence and value attitudes when dividing a class into populations that self-report expert versus novice behavior when answering clicker questions (Len, 2006); there are probably other statistically significant differences in sub-populations that can be data mined in future studies. Zeilik, M. & Morris, V. J. 2003, "An Examination of Misconceptions in an Astronomy Course for Science, Mathematics, and Engineering Majors," Astronomy Education Review, 2(1), 101. Development of the SATA, a 34-question, five-point Likert scale questionnaire that measures four attitude subscales. Len, P. M., 2006, "Different Reward Structures to Motivate Student Interaction with Electronic Response Systems in Astronomy," Astronomy Education Review, 5(2), 5. Comparison of student populations divided by self-reported behavior when answering clicker questions, measured by the SATA and other surveys. These results are comparable to previous semesters of Astronomy 10 taught by this instructor at Cuesta College. In comparison the MPEX was given to Physics 8A (university physics, calculus-based, mandatory adjunct laboratory) students at Cuesta College, San Luis Obispo, CA, during Spring semester 2007. Of note is that Physics 5A students used numerical keypad clickers (Classroom Performance System, einstruction.com) to enter homework and to engage in peer-interactive discussion questions during lecture, whereas Physics 8A students had only traditional lecture. Physics 8A students had lower favorable initial attitudes towards coherence (i.e., "believes physics needs to be considered as a connected consistent framework," as opposed to "believes physics can be treated as unrelated facts or 'pieces'"), but these increased to levels comparable to the Physics 5A students, whose coherence attitudes remained static. Physics 5A students have both higher initial and final attitudes towards reality link ("believes ideas learned in physics are relevant and useful in a wide variety of contexts," as opposed to "believes ideas learned in physics has little relation to experiences outside the classroom") than Physics 8A students, but experienced a similar negative initial-to-final shift in these attitudes. The third difference was the less favorable final attitudes of Physics 8A students towards effort (i.e., "makes the effort to use information available and tries to make sense of it" versus "does not attempt to use available information effectively") than Physics 5A students. These results, while intriguing, do not by themselves validate or invalidate the use of clickers in introductory physics, as there is no direct traditional lecture versus clicker instruction Physics 5A comparison; these results may merely be due to the differences in student populations in Physics 5A (typically pre-medical or architectural technology majors) versus Physics 8A (engineering majors). Further studies at Cuesta College in future semesters should compare Physics 5A students with and without clicker instruction, as well as Physics 8A students with and without clicker instruction. However, it is interesting to note the lower initial final attitudes of Physics 8A students compared to Physics 5A students towards coherence and reality link, compared to Physics 5A students--these lower attitudes for Physics 8A students would be opposite of what would be expected of engineering majors, compared to the pre-medical and architectural technology students in Physics 5A, before any instruction (traditional lecture or clicker peer-instruction) has taken place. Color and position shifts give a convincing illlusion of Christopher Walken moving in front of a galaxy background. "You Rock The Galaxy" by T. D.
"Thanks P-dog" by Mitch B. "Not just sucking up" by K. N.
"Thank you for everything" by Mel R.
A 0.50 kg box is held stationary against a k = 85.0 N/m spring, compressing it a certain distance from its equilibrium position. The box is then released, and moves up a frictionless ramp. When the box is at a height of 0.75 m above the base of the ramp, it has a velocity of 1.3 m/s. How much was the spring compressed from its equilibrium position, before the box was launched? Neglect drag. Show your work and explain your reasoning using the properties of energy conservation. Correct. Identifies relevant terms in energy balance equation (Ktr, Ugrav, Uelas), and solves for xi. Implementation of right ideas, but in an inconsistent, incomplete, or unorganized manner. At least some attempt at energy conservation, but with missing or misapplied energy terms. [20 points.] A horizontal force of 18.0 N is required to keep a 2.00 kg box moving across the floor at constant speed. A box of unknown mass is then stacked on top of the 2.00 kg box. A horizontal force of 56.0 N, applied to the 2.00 kg box, is required to keep both stacked boxes moving across the floor at constant speed. What is the mass of the unknown box? Show your work and explain your reasoning. Correct. Sets up Newton's first law for each of two situations (2.00 kg box sliding at constant speed; 2.00 kg + m2 boxes sliding at constant speed). Reduces these two equations to solve for the two unknowns μk and m2 (or eliminates μk to find only m2). May instead appeal directly to a ratio of 2.00 kg to (2.00 kg + m2), in relation to the ratio of kinetic friction forces in order to find the unknown mass. Nearly correct, but includes minor math errors. As (p), but solves for the combined mass of (2.00 kg + m2), and not for the unknown mass m2 itself. Nearly correct, but approach has conceptual errors, and/or major/compounded math errors. As (p), but uses Newton's second law, and eliminates acceleration common to both second law equations to find unknown mass. Implementation of right ideas, but in an inconsistent, incomplete, or unorganized manner. May use work-energy conservation concepts.